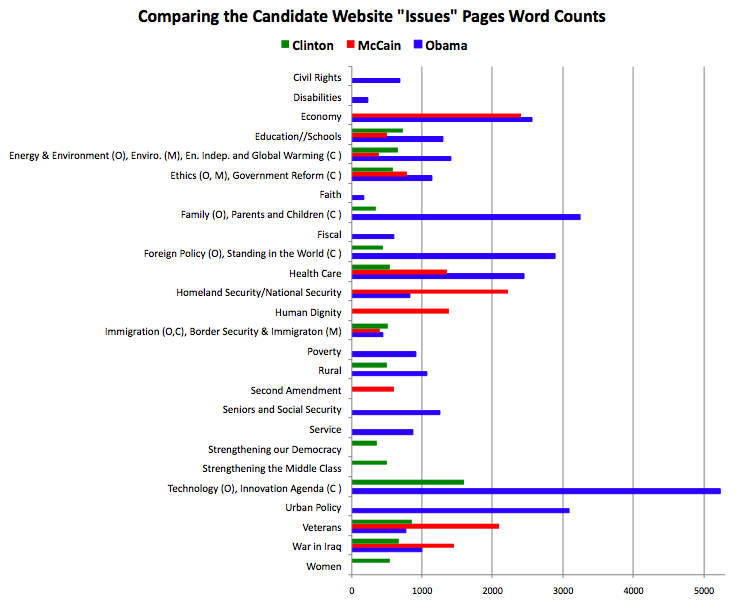 All the major presidential candidate websites are generally similar in their structure. All three feature an “issues” tab, with pages on a variety of issues. These sometime link to other materials, such as lengthier plans in PDF format or other materials, but I thought the choice of issues and length might tell us something about what each candidate’s campaign think is important. At the very least, it might speak to the interest groups they’re cultivating and their general philosophy about how much information they should provide before requiring visitors to click more. Of course, what candidates say about their priorities, and what they actually do in office can be quite different for a variety of reasons. Obama’s top three are technology, urban policy, and family, and McCain’s are economy, national security, and veterans, and Hillary Clinton’s are innovation, veterans, and schools. I noticed both Democrats have long pages on technology and innovation issues, a topic McCain omits entirely. Barack Obama is also unique in organizing a variety of urban-related policy proposals and positions under the umbrella topic of Urban Policy, something that was added to the website since I scrutinized it last. As the first bullet to his plan he proposes creating a White House Office on Urban Policy to “develop a strategy for metropolitan America” and coordinate federal urban programs, reporting directly to the president. 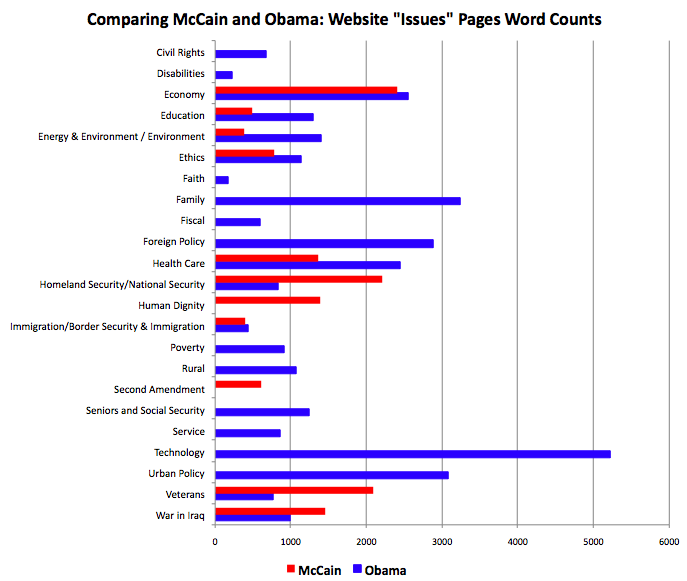 Update: On the suggestion of Andrew Gelman, here’s a different version ranked by the difference in words between Obama and McCain. I rather have the Feds just drop off the money at city hall and leave. I much rather have urban policy set at the local level than the national. What the word count fails to reflect is the vacuity of what little McCain does have on his website. For instance, from eyeballing your graph, it looks like Obama has about 3-4 times the word count for energy/environment, but the actual substantive discrepency is much greater. Obama has seperate issue pages for energy and the environment, and has pdf’s totalling about 30 pages with detailed policy proposals laid out. McCain, on the other hand, has 5 paragraphs saying nothing under the environment page, and has no energy issue page at all. Furthermore, he hasn’t put forward any specific energy proposals or goals in any context. He talks a lot about reducing dependence on foreign oil, but he’s been running for president for over a year now and has no actual energy policy to judge. How disappointing that McCain out-words both Obama and Clinton on “War in Iraq”, almost as if it were a positive for the electorate that McCain could run on and the Democrats could only run away from. They should be hammering the Republicans on it, not sweeping it under the carpet. Pingback: Steve Kass » "Why not?"